Today I read an article about Yahoo's BOSS: Build you Own Search System, but it didn't specify a URL for the new Yahoo offering. 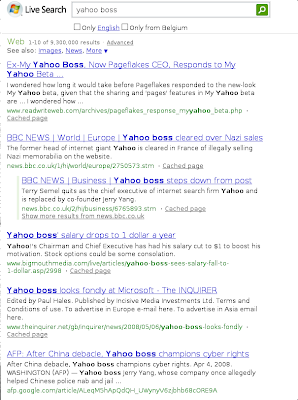 So I typed in the Firefox search box the words "yahoo boss", and got the links as the first item after the News result displayed at the top. Quite effective! 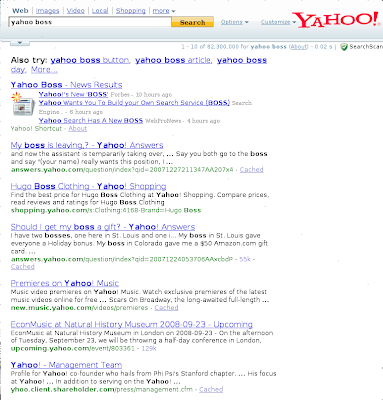 But then I thought: I'm looking for a Yahoo service, I might also make a search on Yahoo's website. Google is the default search engine for a lot of people, including me. 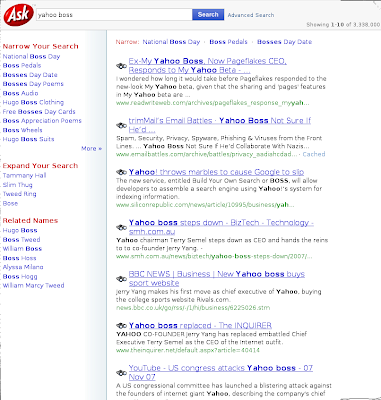 Maybe I should take a look around, for example at Yahoo search! Honnestly I was surprise to not see a single link about it on the first page. So I looked on the following pages and didn't even see it in the first 5 pages. I abandoned looking further. This awakened my interest: Would Microsoft do better? Not at all! Nothing in the first 5 pages. Ask.com maybe? Good try, but no. 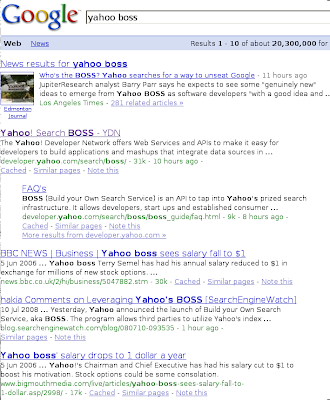 Microsoft might be interested in buying Yahoo's search business, but mixing 2 irrelevant search results stays irrelevant. They'd better work hard to deliver better search results. At that time I would possibly change Firefox's search box' default search engine. That time has not come yet though.